Chromcraft&apos;s CD154 five-piece dining collection set from Carolina Furniture features a medium oak finish and "Bamboo Frier" chair upholstery. The arm chair includes a memory foam seat. 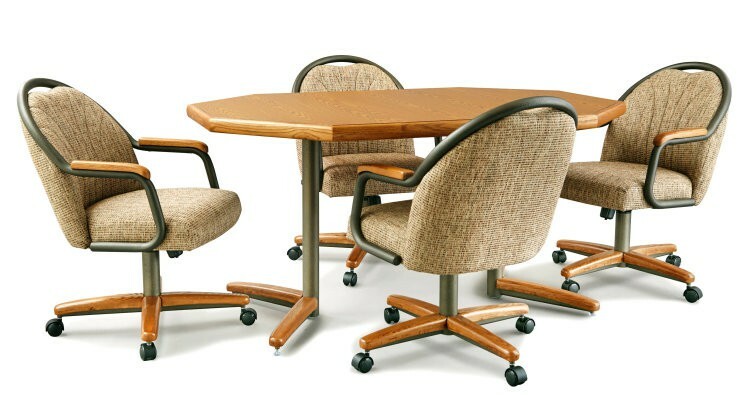 5 piece set is comprised of a clipped corner table with 18" leaf (measuring 42" x 42" without leaf and 42" x 60" with leaf) and four caster chairs.